Unfortunately time constraints (i.e my day job) keep getting in the way of me updating this site so all Ive been able to do so far for the Crystal Palace Nickname page is a very basic bit of background. 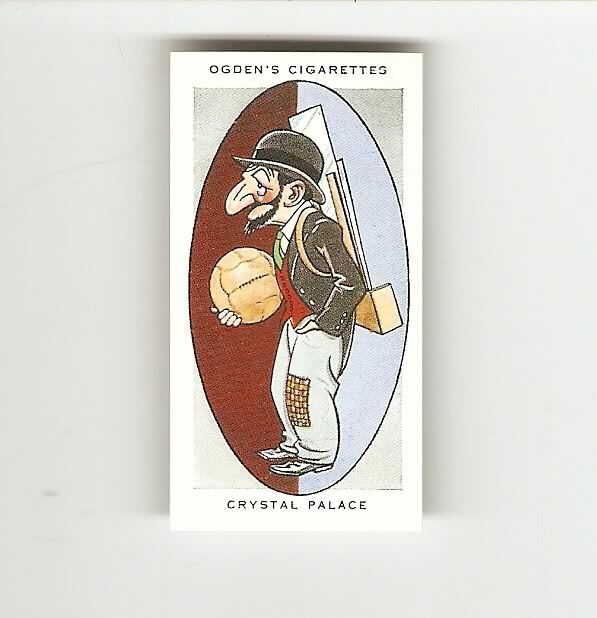 Ive shown below a football cigarette card from the Ogdens AFC Nicknames series that shows a caricature that depicts a "Glazier", which of course is one of Palaces earlier nicknames. "Crystal Palace first played in that wonderful natural amphitheatre in the picturesque grounds at Sydenham where the Cup Final used to be decided, and under the shadow of the “big glass house”. It was in the this setting that they were given the nickname of the “Glaziers”. They subsequently moved to a ground at Selhurst Park a few miles away, but there has been no change of name. Admitted to the Second Division of the League in season 1921-22, they lost their place at the end of 1925 and have since competed in the Third Division, finishing as runners-up in 1929 and 1931. The “Glaziers” have some fine performances to their credit in the Cup competition". So, thats all Ive done so far but dont worry I will be coming back to this page to expand on this particular teams nicknames a bit more.